How to make Mobile Banking safer! or tablet is safe and convenient, and an educated user can help keep it that way. Here’s what you should know. There’s a good reason for the incredible popularity of smart phones and similar mobile devices. They can be carried anywhere, and increasingly, they can do many of the functions of a computer, including online banking. By one estimate, 238 million people in the U.S. have mobile phones—78 percent of the population. Chances are you’re one of the 52 percent of consumers who have accessed some form of mobile banking. Or perhaps you haven’t put your toe in the water yet…you want to know more. 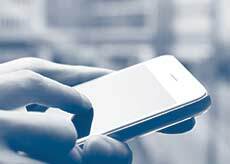 Just as the name implies, Mobile Banking is a system that allows customers of a financial institution to conduct financial transactions through a mobile device such as a mobile phone, a personal digital assistant or a computer tablet. Mobile app-Some banks may offer a special “app” (a software application designed for a specific purpose), allowing you to log into your accounts and conduct business. Mobile web browser-This allows you to login to your account through the internet using your phone’s browser and internet connection. SMS/text-You can set up text alerts or text your bank for information about your accounts. Are there risks with mobile banking? As much as 36% of users don’t even lock their devices with a simple PIN or password. Few consumers have any form of anti-malware software on their mobile devices and, with little consideration for security, many are willing to download apps from virtually any source. Because they are mobile, cell phones and tablets are regularly used on public networks, which are inherently less secure. Making matters worse, customers are far more likely to lose a mobile phone than a laptop. How do I make mobile banking safer? Don’t get phished-Avoid clicking on links in text messages or emails, since these links may lead to malicious websites or downloads. Don’t save login information on your mobile device, especially to online banking or e-commerce sites. on your device and set it to auto-lock after a certain period of time. Carefully review your mobile phone bills for any suspicious charges or activity. Create secure passwords and keep your PIN safe. Change your password often, and do not use your pets’ names, your child’s name, or any birthdays. Consider installing a security app from one of the known and reliable security providers. When used properly, mobile banking can be just as safe as any other form of online banking. Safety and security begins with treating your mobile device the same as a computer or laptop.Then, additional measures to safeguard against loss of the device, as well as use on public networks, can go a long way toward personal safety. And finally, if you are like most people, you usually know where their phone is—often within arm’s reach 24 hours a day. If you lose it, you know it almost immediately, unlike a wallet or a credit card, and can notify your bank before any damage is done. To learn more about your bank’s mobile banking opportunities talk to your banker.